On Saturday 13th April, First T Scooters are hosting their competition right here at Rush Skate Park. The competition categories are as follows: (If you have a query with which category to enter, please to speak to a member of the First T staff on the day). The competition will run based on the following format: (Dependent on numbers). The competition will take place in the main park section. Round 2 will be run based. Each rider will be given the chance to perform 2, 50 second runs within the park section of Rush Skate Park. This will be judged on ‘Style’, ‘Difficulty’, ‘Use of Park’ and ‘Flow’. Style - How the tricks and overall run looks. Clean runs with smoothly landed tricks will net you a good score. Quirky tricks and unique ways of performing your run will also pay off in this category. Sketchy landings will not score as highly. Difficulty - The overall difficulty of your tricks and run. Bigger airs, higher jumps, longer gaps and more complicated / technical tricks all go toward your difficulty score. Aim to go big! Use of Park - Use as much of the park section as you can to build up your point score. The judges want to see you hit as much of the park as possible in your run, try and throw a trick over everything you can. Flow - How you get from A - B - C etc… Making your run look effortless goes a long way in a competition! You will get points based on how well you connect your run together, flowing around the park with more speed and without stopping will allow you to earn higher in this often overlooked points category. Entering a competition is all about having fun, so the most important rule is to enjoy yourselves! Please make note that all competitors, even those over the age of 18, must be wearing a correctly fitted helmet to compete. The First T scooter competition is a Scooter Only event. Claudius Vertesi is returning to Rush skate park! February’s Sliver Surfers will be on Friday 22nd! 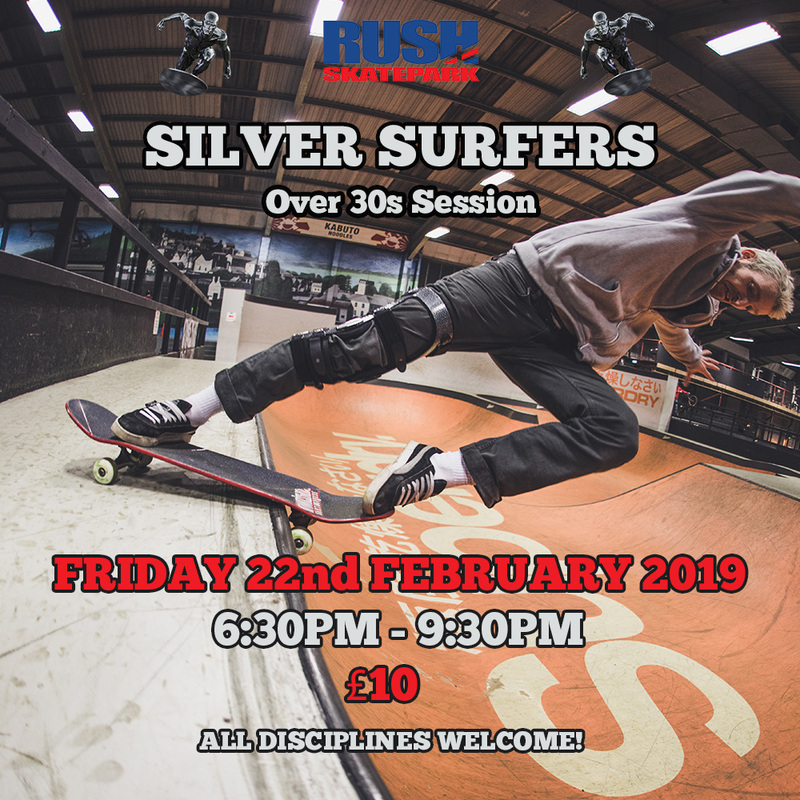 This is our monthly session for riders 30+ and is perfect for those just picking up an action sport or the veteran rider/skater! The session will run from 6:30pm - 9:30pm and costs £10, see you there! The first Rush Scooter competition of 2019 is going down on February 16th! The Rush Skate Park Spot Battle will consist of 5 different ‘best trick’ style competitions that will take place on various ramps and obstacles within the Rush Skate Park Street and Park sections, these will be announced shortly. Please note that this is NOT a run based competition. The Battle will run from 12.30pm right through to 7pm on Saturday 16th February. The competition will cost £25 for non-members and £20 for members. There will be several different categories to compete in, so there will be something for riders of all levels and will be a great start for those looking to push their way into competition! We’ve got some awesome prizes up for grabs on this one, so get involved! There are loads of prizes up grabs and we’d like to say a massive thank you to all of our sponsors who have donated prizes for this event! January’s Sliver Surfers will be on Friday 25th! This is our monthly session for riders 30+ and is perfect for those just picking up an action sport or the veteran rider/skater! The session will run from 6:30pm - 9:30pm and costs £10, see you there! November’s Sliver Surfers will be on Friday 30th! This is our monthly session for riders aged 30+. October's Sliver Surfers will be on Friday 26th! This is our monthly session for riders 30+ and is perfect for those just picking up an action sport or the veteran rider/skater! THIS EVENT IS NOW FULLY BOOKED! PLEASE NOTE THAT THERE ARE NO TICKETS FOR WALK INS. IF YOU TURN UP WITHOUT A PRE-PURCHASED TICKET, YOU WILL BE REFUSED ENTRY! 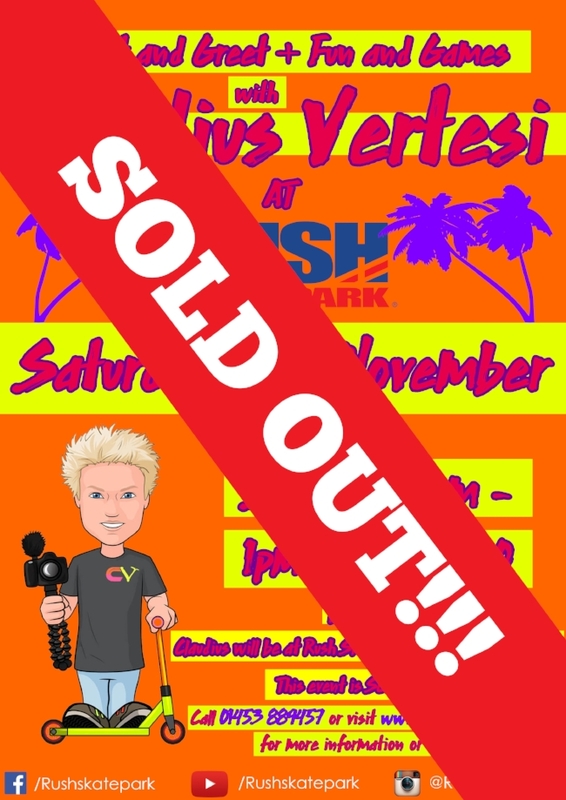 The neon clad YouTuber Claudius Vertesi will be returning to Rush Skate Park on Saturday 3rd November for a day of riding, filming, fun and games! Claudius has a fresh list of activities planned for the day and there will be something for scooter riders of all abilities. The ‘Meet and Greet’ events are always really successful and we highly recommend that you book for this event as it will sell out fast! The session costs £20 and runs from 1pm - 7pm. Claudius himself will be at Rush Skate Park from 1.30pm - 6pm. This event is scooter only. (Make sure you have the events tab selected on the booking system). October's Sliver Surfers will be on Friday 26th! This is our monthly session for riders 30+ and is perfect for those just picking up an action sport or the veteran rider/skater! The session will run from 6:30pm - 9:30pm and costs £10, see you there! On Saturday 22nd September we will be holding an Inline Skate jam at Rush. Fun day at Rush Skatepark, 11am - 7pm!